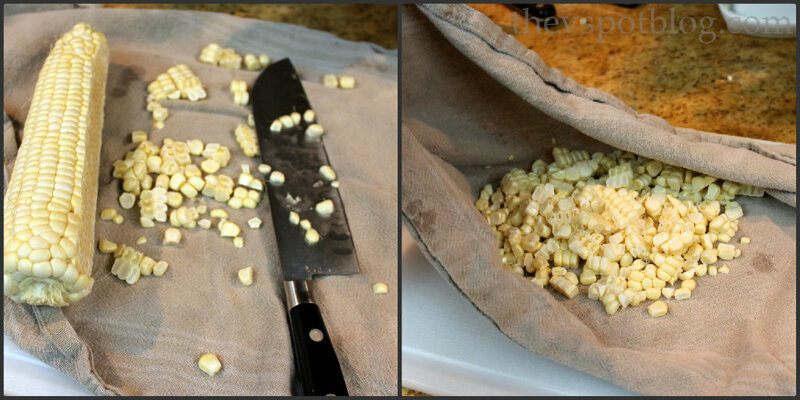 Did you know about this easy tip for cutting corn kernels off of the cob? Yesterday I shared my recipe for (loaded) skillet cornbread, and I had a few people ask me why I cut the corn on top of a dishtowel…. When you lay a clean dishtowel over your cutting board as you cut the kernels off of the cob, the kernels don’t bounce away like the would on a plain cutting board. It’s like they hit the towel and stick to it. 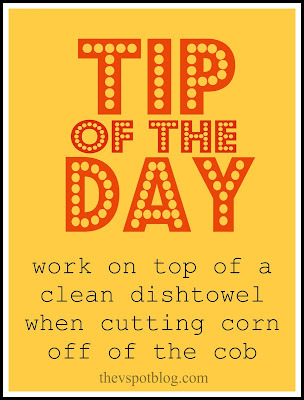 When you’re done, simply gather up the corn in the towel and then put it into whatever dish you’re making from there. I always use an older towel for this, by the way. Anyhow, this is one of those easy tricks I have used for years and I figured everyone knew about it. I guess some didn’t, so I am sharing now. Do you have a favorite cooking tip? What is it? That's a great tip! One I learned recently from Pinterest is to cut corn over a bundt pan. The ear rests nicely on the middle part and the pan catches all the kernels. Sunday Rewind: Growing basil from a cutting.